Asia was more concerned about the weakness of the core Chinese markets after last weeks holiday. The Peoples Bank of China cut (by 100bp) the reserve ratio for lenders on Sunday and that move spooked an already wobbly market. The Hang Seng had already responded to higher US rates last week and so closed off just -1.4%, whilst Shanghai main index lost nearly 4% on the day and closed on the days lows. The CNY also lost ground having closed at 6.87 is quoted late this evening at 6.9325 almost 1% weaker. There is a lot of talk that authorities maybe playing in the currency market and judging by some of the volatility that won’t be surprising. This is not the first time the PBOC have initiated this move, but many are speculating whether this is trade conflict related. Also, rumours remain that Chinese banks are bidding quite aggressively in the forward market for USD over year end. China bank shares were all lower with declines of around 3.5% across the board. The SENSEX was dipping in and out of negative territory, but fortunately finished positive. However, during the Asian session the INR traded with a 74 handle, but has managed to recover some of that in the US time zone. The domestic situation in India remains vulnerable as we approach elections in five states and energy prices climb. Tricky time here as the currency has few friends at present. It was Italy that grabbed the headlines yet again today as concerns over the Italian budget recaptures mainstream news. 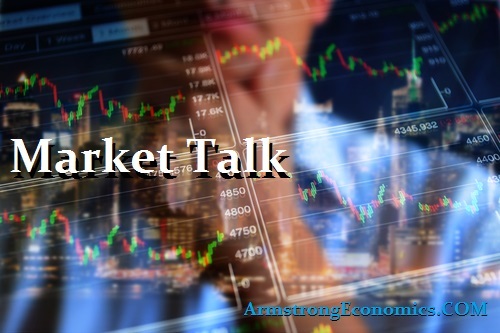 The response the markets heard over the weekend from the EU has raised concerns again and the markets reflected this in no uncertain terms. The FTSE MIB lost over 2.4% and the 10yr BTP gained 14bp (higher yield is lower price). Greek bonds also responded losing 13bp on the day, with the bank shares also suffering large declines. We do have more key data this week (inflation, GDP and Productivity) together with G20 with IMF and World Bank meeting. All core European indices closed down around 1.15%, but worth keeping an eye on currencies still. Currency is the pressure value for an economy, but with Europe this is forced into the debt markets. The trend and capital flow continues in favour of the US Dollar. UBS another hot market topic worthy of an eye this week. US markets had just equity markets open today as Treasuries were closed. They did have an ETF to follow however, and that was declining and so we saw an erratic days trading for core indices. Having seen the DOW off 200 points from its high, we eventually saw a positive close. Interesting that utilities are finding good support at this time, whilst we see some profit taking in tech and real estate relatives. Asia will be a guide for tomorrows European session, but having seen a confident recovery in late US trading all eyes will return to the peripheral concerns. US markets look to be responding to the capital flow, so worth keeping a very close eye on the Euro over the next couple of weeks. Japan 0.15%, US 2’s 2.88% (closed), US 10’s 3.23% (closed), US 30’s 3.41% (closed), Bunds 0.53% (-4bp), France 0.87% (-3bp), Italy 3.56% (+14bp), Turkey 19.83% (+15bp) – but did see it print 20.24% intraday – Greece 4.58% (+13bp), Portugal 1.96% (+3bp), Spain 1.59% (+2bp) and Gilts 1.67% (-5bp).